Four weeks ago we welcomed baby Ryan into our family. While I am enjoying snuggling with him and spending time with my other two kids, I have some special guest bloggers scheduled to share some great posts with you! Today I am so happy to have Leslie from Cute and Peculiar sharing a great pre-writing activity with us. Welcome Leslie! Pre-writing activities vary from manipulating Play Doh to doodling. Really it's anything that builds muscle control and hand eye coordination. Some more common pre-writing exercises are the pre-writing worksheets where kids trace lines from right to left. As helpful as they are they can sometimes be a little boring. When I noticed my two and a half year old (Bear) tracing shapes with his finger in books it got me thinking of fun ways to introduce the same concept. This is an easy project that can be changed to accommodate different ages. I used window markers and drew simple shapes and "paths" connecting the matching shape across from it. I drew this on the outside of the window. This makes it easy to trace and re trace the path without having te re-draw the whole thing over and over. First I had Bear trace the paths with his finger. Then I handed him a few window markers and had him try to trace the paths. He wasn't completely able to do this but did understand that he should stay on (near) the lines. The last image is the end result. I did the square match up myself to give you an idea of what it would look like. 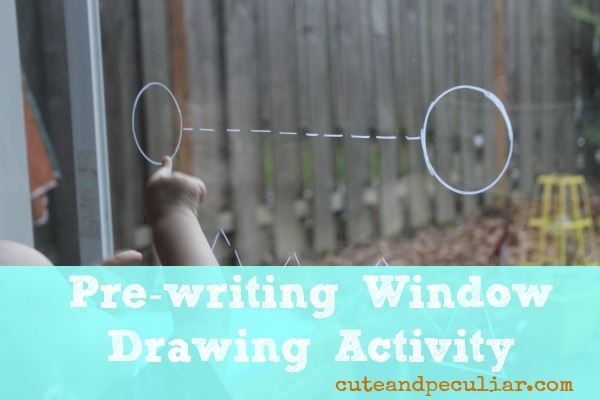 For older children you could make more difficult lines to trace or you could even tape a page from a coloring book on the outside of the window and have your little one color it from the inside. They could color it over and over. Extra mom bonus: it gives you an excuse to clean your windows. Thank you Kristina for this wonderful opportunity to be a guest on your awesome blog. I hope you and your family are enjoying all your much needed time together. Thank YOU Leslie! What a fun activity. 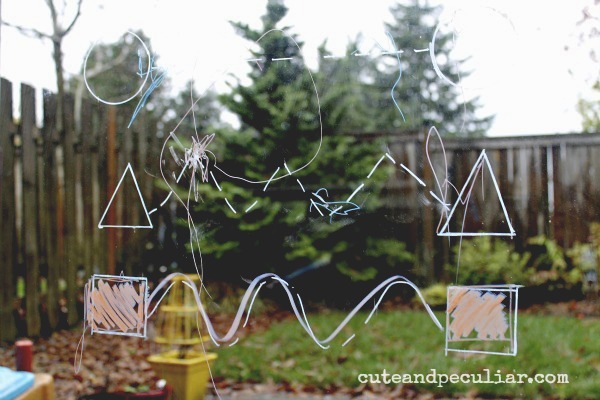 My kids love any excuse to draw on our windows, so we will be trying this soon! 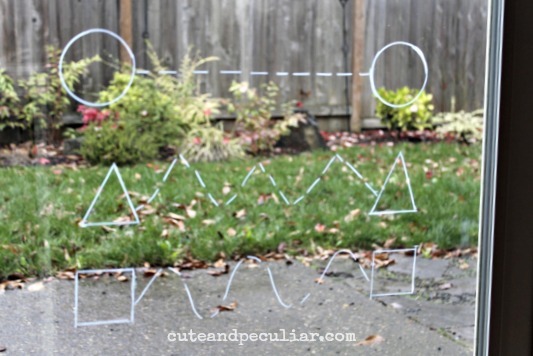 Make sure to check out Cute and Peculiar for more of Leslie's creative ideas! Leslie is a stay at home mom of two little boys, Bear (2.5) and Wolf (1). 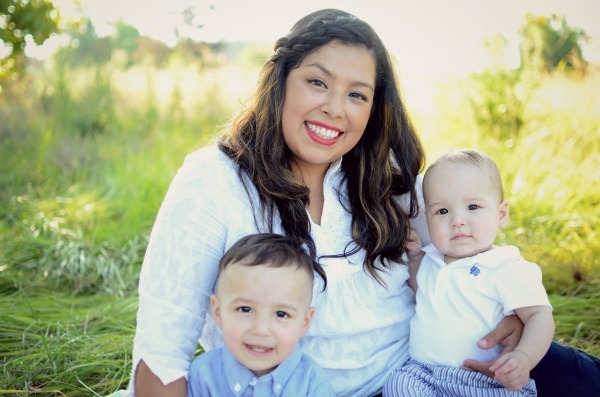 Originally a preschool art teacher she loves finding fun and creative ways to teach and play with her boys. For more projects and ideas you can check out her blog Cute and Peculiar, and can also find her on Facebook and Twitter. What a great idea! My four yr old son loves tracing everything, and now it's time for indoor activities where we live. So thanks for the ideas! Happy blogging! What a wonderfully creative way to integrate fun and per-writing! Pinning. Wonderful post! Very unique approach. My kids are older but they love drawing on the windows. I tried these window markers which were more like oil pastels and they were messy. We like dry erase markers for the windows. They work great. Love your prewriting exercises! Pinning it to my writing fun board! My toddler will love this! Can't wait to try it! 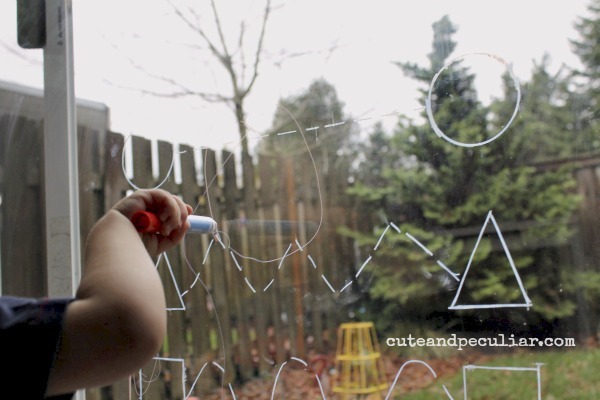 Children love to draw on the windows when they are fogged up, so why not make your own drawings to entertain them? I liked this unique idea.